During the peak of most big game hunting seasons, a taxidermist’s shop is a magical place to be. 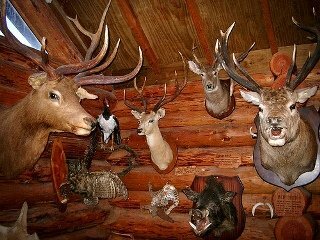 Not only is the taxidermist and his staff excited about new incoming specimens, but hunters and their families enjoy the re-telling of their hunts, and everyone enjoys the fulfillment of being a useful participant in the natural order. However, the taxidermy shop can also be a sad place where high hopes are dead on arrival and dreams of getting something ‘mounted’ are shattered due to poor planning and the poor handling of potential specimens. There are too many different animals to cover in a short article, so I will concentrate on big game animals in general and how to commonly care for them. I have been a taxidermist, both full time and part time, for 20 years. I have seen a lot of mistakes made by hunters and taxidermist, so I want to share the two most important nuggets of knowledge that every hunter should know about, skinning and bacteria. First, learn how to properly skin your animal cape all the way to the head. For general taxidermy purposes, the cape should be considered the entire front half of the animals’ skin. Once most animal capes are skinned all the way to the head, and the head is removed with the cape hanging from it, that specimen is now safer as it can be put into a freezer or walk in cooler. This will hinder bacteria growth. Skinning for the butcher is not the same as skinning for the taxidermist. Learn where to make your cuts and don’t deviate. The best place to learn this is at the taxidermist’s shop. Stop by during the slow summer season and politely ask all the questions you can muster. Any good taxidermist will be glad to help you. It is not only ethical to assist someone, but it helps the taxidermist in the long run as well. For example, they will show you how to not cut through the arm pits and how to follow hair patterns with your blade. Also, your taxidermist will show you how long to cut a cape. It’s difficult to stretch a skin for a good shoulder mount if there is not enough there. If a taxidermist teaches you how to do things correctly, then you can teach others how to do things correctly, and so on. Don’t be shy and don’t let your ego get in the way. Secondly, the enemy of all dead things is bacteria. Bacteria break every once-living cell down (commonly known as rotting). When a specimen begins to rot, one of the first signs of damage is something called ‘slipping.’ This happens when hair begins to inexplicably fall out in large clumps. Once this happens, saving the cape is technically impossible. The most common cause of bacteria growth is heat and moisture. Moisture is bad, but heat is the angel of death when it comes to capes. I once had a hunter lose a cape after he brought his animal straight to the shop after being killed. It only took the hunter an hour to get to the shop and it weather was cool enough that it was not a factor. The hunter was distraught when I let him know and I could not explain it, but we eventually solved the mystery. He drove an old pick up that had the exhaust system running up against the bottom of the bed. The paint was kind of chipped on one side and we discovered that the muffler was superheating the metal bed. His trophy literally cooked during that one hour ride. Bacteria do not care about you or your trophy. There is a certain cringe worthy statement that has been passed down through the generations that should never be spoken by any hunter, and that is, “a good taxidermist can fix anything.” I am here to tell you that no they can’t, they just make it look like they can. When a crying hunter gets the bad news that his cape is probably too butchered to save, yet he miraculously gets a perfect mount back, the taxidermist probably just replaced the cape. A good taxidermist can only fix so much. It is up to the hunter to learn proper skinning techniques and how to avoid the enemy called bacteria.